Just after 7p.m. May 12, police were called to the 300 Block of West Santa Fe Street in Garden City for a reported man with a gun, according to a media release. The suspect was gone before officers arrived. 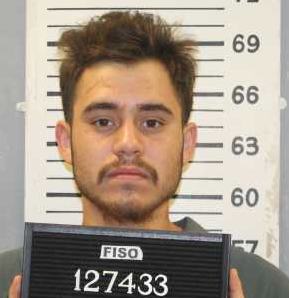 The investigation revealed a graduation celebration was occurring in the front yard at the address when they were approached by 21-year-old Joe Fry of Garden City. A conversation ensued and Fry referred he was armed with a gun. A short time later Fry was seen walking down the alley pointing a handgun at those in the front yard at the party. The victims in the yard fled the area and called the police. While police were searching the area, Fry was located and fled from police on foot. Fry jumped the fence to the City of Garden City Fleet Maintenance shop and was arrested without incident inside the shop lot. After the arrest of Fry a handgun, marijuana, and drug paraphernalia were located in the area the arrest was made. Officers also located electronic items and tools that had just been taken from a residence in the 500 Block of West Santa Fe. Possession of Drug Paraphernalia Interference with a LawEnforcement Officer, Criminal Trespassing and Criminal Use of a Weapon, according to the release.